Rolling on 27.5-inch wheels, powered by Split-Pivot credentials, and loaded with 165mm rear and upgraded 170mm travel in the fork, the versatile Spartan brings adept handling and bottomless stoke to the downward slope. Improved suspension dynamics increase lateral stiffness for a cutting-edge climber. 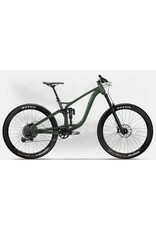 And its shortened carbon chainstay brings leaner, meaner Enduro muscle to the trail or track. Additional features include a 36T compatible front ring, 170mm dropper post (compatible on M-L-XL), 2.6 tire clearance, metric shock, and front and back boost. The bike’s carbon bashplate hides a Di2 battery. Ditch the electronics and it becomes a whatnot nook. Spartan ’19. Climb on and kill it all.